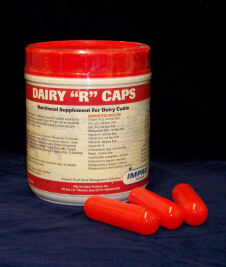 Similar to Dairy ‘M’ Caps but containing additional Vitamins A and D, Dairy ‘R’ Caps are designed to provide an additional source of nutrients essential for the proper functioning of a healthy immune system. Dairy ‘R’ Caps can be especially benecial during most stress situations. Give 1 to 2 capsules every 12 hours for up to 3 consecutive days.